Travel guide to Santiago - AllSantiago.com | The independent City Guide to Santiago, Chile. At the midpoint of Santiago’s extensive urban region, the Historic Quarter or Centro histórico still reigns as the condensed, action-packed heart of the city. This is probably one the world’s last remaining bastions of devoted churchgoers, antiquated Señores and decadent coffee parlours. Its lively streets, awash with art deco palaces and baroque churches, still convey a flavour of old-time, genteel South America. 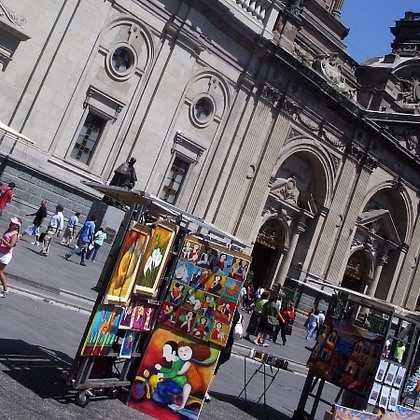 To get a taste, just walk around the imposing elegance of the Barrio Cívico – Santiago’s power hub – or stroll through the courtyards of the historically-charged La Moneda. If it’s buzz and chaos you’re after, there’s no experience like the head-spinning Plaza de Armas and the area’s entangled commercial arcades and their Fuentes de Soda. Be sure not to miss the line-up of beautiful and intriguing churches, among them San Agustín, with its history of miracles and murders, or the splendidly preserved convent of La Merced and its hidden colonial treasures. Compliment your tour of the area with a visit to the area’s palatial tearooms or ‘confiterías’ or to the Mercado Central, Santiago’s legendary wholesale market. Santiago is garnished with an assortment of barrios, each a multi-faceted neighbourhood with a distinct flavour and sense of community. There’s cosy Bellavista, a residential area at the foothill of the Cerro San Cristóbal, once home to Nobel-laureate Pablo Neruda and scene of an astonishing nightly transformation with its scores of bars, restaurants and artsy shops. 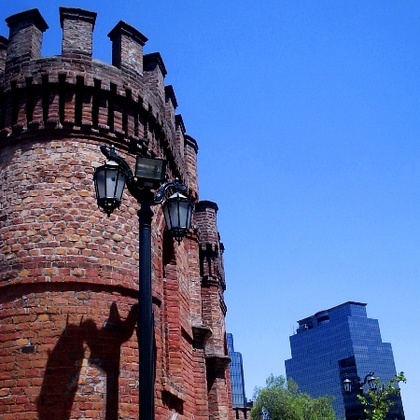 There’s also Lastarria, an audacious district boasting the highest quality in museums, theatres and bookshops. This arty barrio is adorned by the romantic Cerro Santa Lucía, a former 16th century Spanish fortification that doubles as a hilly and labyrinthine public garden. Not far from here lies the Iglesia de San Francisco, a colonial church boasting a sublime collection of baroque paintings and macabre religious art. Some areas like República and Dieciocho will take you back to the refinement and sophistication of 19th-century Santiago, whereas those like Barrio Brasil will offer you a glimpse of the capital’s ever-expanding underground arts scene, with a choice of art galleries and music venues. Finally, the districts of Santiago Oriente: (Providencia, Las Condes and Vitacura) offer designer shops, high-end restaurants and tantalising modern architecture.